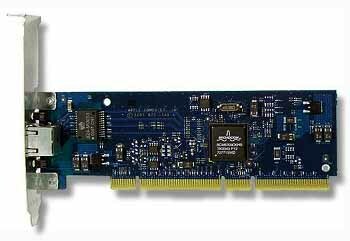 Gigabit Ethernet PCI Card for the Mac! Add 1000 Base-T $24.77 shipped! Free Kitchen Sink CD includes drivers! Genuine Apple 10/100 PCI Ethernet Card. 4 LED's to let you know the machines status on your network. No extra software needed for most applications. It uses the built in Apple drivers already installed on your system, except on the early Mac OS 7.5-8.1 which requires the Apple 10/100 driver on the OS8/9 Kitchen Sink CD. Clean and tested pull. Works in any PCI capable Mac with any OS version from 7.5 to the latest versions of OSX. We recommend this card if your systems built in is not working since it is so easy to install. Requires an open PCI slot. Take full advantage of cable or DSL connections and 100 BaseT Networks. Great replacement if your built in isn't working, or a great speed improvement over the older 10 BaseT on earlier beige systems. REQUIRES: the ability to remove a phillips screw and insert a card in an open PCI slot and replace the screw. List Price $79.95 Our Special $24.77 includes your shipping. 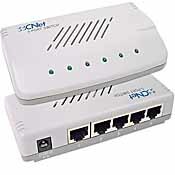 Just connect your DSL or Cable Modem to the EtherFast® Cable/DSL Router with 4-Port Switch and all the computers in your household can share a wired connetion to the Internet, at the same time. The built-in 4-port switch lets you attach four local devices directly, or daisy-chain out to more hubs and switches as your network grows. Once your computers are connected to the Internet through the Router, they can communicate with each other, sharing resources and files. Used, tested, clean - $19.77 including shipping! D-Link DI-704 Internet Gateway and Firewall with 4 Port Switch. 10/100 Speed. 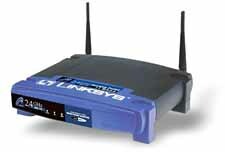 LinkSys is my brand of choice for reliability, performance and price. These are the old style units we used here at Headgap up until recently. Heavy metal style cases. These are used units thoroughly tested, cleaned and polybagged. Just plug them into your router using the uplink port with the supplied cable, hook up the power, and add 5 more 10/100 ports to your network. Our $22.00 price includes domestic shipping. Limited quantities order now. 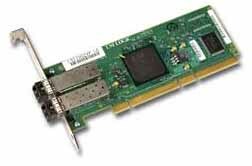 Apple G5 or Xserve Gigabit Ethernet PCI Card. Reburbished tested pulled working card. Works perfectly well in your G5's PCI slot. Replace the damaged built in port or add a second port. Part Number: 661-2677, 661-2677-R, 630-3816, 820-1412-A. Compare at $99.00, Our $49.77 price includes domestic shipping. 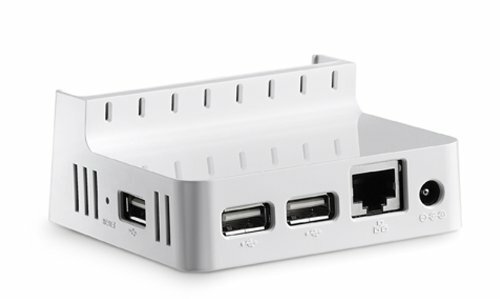 FreeAgent DockStar Network Adapter. Make contact with your content wherever you go. Includes Pogoplug Internet file sharing service. Connect up to four drives and access all of them from one DockStar Network Adapter. Looking for a low cost switched hub? Tested used units. The CNet 5-port switch features 100Base-TX/10Base-T port speeds and half and full duplex operation. Each port has an Auto-Negotiation function that senses the attached maximum operation bandwidth and automatically sets the connected port to operate at 20Mbps or 200Mbs at full-duplex and up to 100Mbps at half-duplex. Easy to read diagnostic LEDs and plug and play functionality are offered with this CNet 5-port switch. Just plug and play for any ethernet capable Mac or PC. Our $19.99 price includes domestic shipping. 3 Ft. Mini Din 8, 3 Position Push Button QuickSwitch For Printers and Modems. Got a serial port fried on your computer? Use this NEW 3 in 1 switch to solve your problem. Easily switch between your modem, printer or other serial device without having to plug and unplug the devices. Our $14.99 price includes shipping. Original Airport Card, Used, Tested - $49.77 includes shipping! We had so many calls for these items when we found a source we bought some. These are the original Apple Airport Cards. They are used. We thoroughly test each card to make sure they perform like new. These work in the G4's, iBooks and others and make them wireless. iMac G3's require an adapter card. Our $49.77 price includes domestic shipping. Used tested unit. Zonet 8 Port 10/100 Switch. 1 MB built in buffer. Full and half duplex support. Automatic source address learning. LED indicators for installation and operation diagnostics. Plug and play for Mac or PC. Includes power supply. Our $22.99 price includes domestic shipping. Used Asante ethernet card for your NUBUS Mac at a bargain price! 10BaseT Nubus Ethernet Cards. Tested pulls. All have standard 10BaseT plug socket. System 7.5.3 (perhaps earlier) and later automatically recognize the cards. 7" length - fits NuBus slots on systems like the IICI, Quadra 650, 7100 and up (any machine that will take the short 7" nubus cards). Was 19.77 Now $14.77 Price includes shipping. This Ethernet adapter lets you connect Apple LCPDS platform through built-in internal 10baseT transceivers to an existing or a self-designed network at a minimum effort. It is fully compatable with Apple EtherTalk driver found with Apple platforms, and can be used with most popular network hardware and software. Used tested pulls. Was $24.77 SALE $14.77 includes your shipping. This Ethernet adapter lets you connect Apple Comm Slot platform through built-in internal 10baseT transceivers to an existing or a self-designed network at a minimum effort. It is fully compatable with Apple EtherTalk driver found with Apple platforms, and can be used with most popular network hardware and software. Used tested pulls, various name brands. Yours may vary from picture but work straight up with the built in OS drivers. Works in 64, 6500, 54, 5500 and any other Mac or Performa that lists Comm Slot. Not sure if this fits yours? Give us a call or email. Your price $24.77 includes your shipping. Ethernet Cable Coupler - New! Easily add another cat 5 ethernet cable as an extension. Couples two items with RJ45 plugs together. $2.99 when ordered with other item(s). Ethernet Cable Crossover Coupler - New! Couples two items with RJ45 plugs together in crossover configuration. Why buy special cables when you can simply plug this in? Great for gamers. Free shipping. The AAUI style of transceivers connect your Macintosh desktop computer or Apple printer to an Ethernet network. Requires an AAUI connection on the back of your computer. The style will vary from the picture and these are various brands but all tested good. Suggested Retail is $29.99 and up, Our Price is $16.77 and includes shipping. Various brands all tested good with phone cable. While quantities last $5.88 includes shipping. See the modem area for longer phone cables. Call for quantity discounts! Package of 2 phonenet terminators. They tell your phonenet network where the beginning and end is. These are getting harder to find. Call for quantity discounts. Our price $3.88 includes shipping.